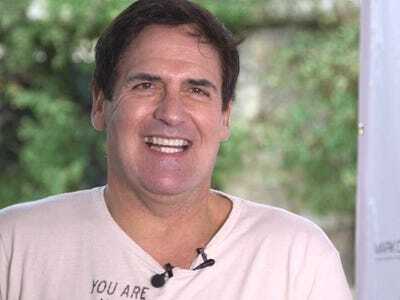 Business InsiderMark Cuban, all grown up. The billionaire owner of the Dallas Mavericks and star “Shark Tank” investor got his first lesson in entrepreneurship at just 12 years old. Cuban tells Bloomberg’s Barry Ritholtz in a recent episode of the “Masters in Business” podcast that he asked his dad for a pair of expensive sneakers. His dad was playing poker and drinking with a few of his buddies, which happened to work perfectly in Cuban’s favour. …It was a box, right? And they were just flat. They were 100 for six bucks, what I sold them for — they cost me three bucks, so I made three bucks a box. And I would literally go door to door to door: “Hi, does your family use garbage bags?” And who could say no? So that’s where I learned to sell. Literally. Every objection [I’d reply], “Of course you use garbage bags, and I bet you pay more than six cents a piece.”… So, I went on from there. The highlight of his young career, he says, was as a college student in 1979 when he was a disco instructor who exclusively taught young women. The bulk of his students were in sororities, and he charged $US25 an hour (“Twenty-five dollars an hour! I would do that job today,” Cuban says).